Book scanning has become more and more popular as we move forward into the digital age. Libraries have been scanning old books for years for archiving but many people are looking for ways to scan their own books. Unfortunately, affordable and fast book scanning at home is fairly limited as far as options but we will cover some of the better choices. Scanning a 200 page book can take a fair amount of time, so why would someone bother? Well, for one thing, there are many out-of-print books that people want access to on a continual basis. Someone studying 17th century English history would benefit from having digitized versions of out-of-print books from that time period at their disposal. Likewise, there are many family genealogists who want a copy of historical records related to their ancestry that are only available at a library or historical society. Some people find it useful to scan books within their trade to create searchable text. It’s easier to find information doing a quick text search of a huge, scanned reference book than flipping through the book trying to find that one paragraph you need. Creating digitized versions of books also allows you to read them on your Kindle or have a portable version with you as you travel. Finally, some people enjoy the freedom of having a vast library of digital books all on their computer as opposed to a large book shelf. Books can take up a lot of space and be troublesome if you tend to move a lot – digitizing can fix that. You can also save money on things like textbooks by scanning a library or friend’s copy rather than buying your own. Okay, so you are ready to start scanning some books but there is one problem you will run into. Traditional flatbed scanners are far from optimal for scanning books. First, flatbed scanners are designed for scanning flat documents so the curve of the page near the binding of the book is an issue. If you have ever copied a page of a book at the library you will understand – the edge text will distort and shadow. This can make the scan difficult to read and almost impossible to covert using OCR. Second, you can damage the spine of a book by scanning with a traditional scanner. In order to get a decent scan you will have to place the open book on the scanner and press down. If you don’t need to preserve the book that is fine, but old books will be damaged by this process which is particularly problematic if the book doesn’t belong to you. The high end scanners that the archival department of a library uses are way out of the reach of most people. We are talking thousands if not tens of thousands of dollars. 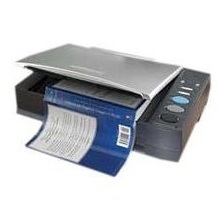 Instead, there of much lower quality book scanners available for home use. These scanners look much like a standard flatbed scanner but are designed to allow the book to hang over the edge so as to give a good scan without damaging the spine. There are also a few handheld portable scanners that can be used for scanning books. These types of scanners are either waved or placed on the page and the scan is created. These are great for scanning books outside of the home but too likely too hands-on for large scale home scanning. The creative option is to build your own book scanner using a digital camera and other equipment. This is do-it-yourself scanning and there is actually a website devoted to creating DIY scanners. However, if you are technically or mechanically challenged this won’t sound very feasible. Lastly, if you are willing to risk damaging your own books, you can use a regular scanner for scanning. If you can live with some edge distortion you can use a flatbed scanner to scan books. 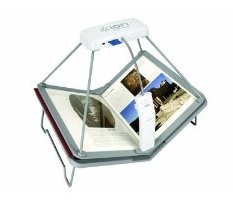 Some scanners even come with lids that specifically accommodate books. Or, you can tear a book apart at the binding and scan each page through a document scanner – it’s fast but your books are now destroyed. If you decide to buy a book scanner you really only have a few options at the moment. 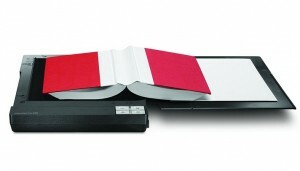 The most popular dedicated book scanners for home use are made by Plustek and cost anywhere from $300 to $800. Customer reviews of the Plustek book scanners are a bit mixed. There is a newer option now being used by many which is basically a document camera system , Check out the Ziggi-HD by Ipevo to see what a device like this can do. Certainly something to keep your eye on. If your book scanning is on the occasional side then a portable scanner like the Vupoint Magic Wand or the Flip-Pal may work. 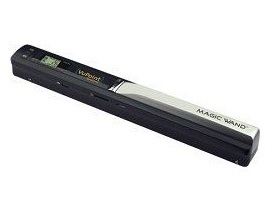 The Magic Wand is a handheld scanner that you scroll across the page. The Flip-Pal is a compact scanner that you can actually place on top of the item to be scanned. Both have their pros and cons as far as book scanning so it really depends on the volume you plan to scan. Finally, both Canon and Epson make flatbed scanners that feature either gutter correction (to reduce edge effect) or expandable lids to accommodate book placement. This can be fine for scanning some pages here and there but not appropriate for older books due to the risk of damage.